Today, successful businesses usually have more than one sales site. These may be different online stores, business-to-business enterprises, or business-to-customer outlets. Moreover, different customers and sales-related data can be received from various survey-campaigns or memberships in clubs, funds, charity events, etc. Gaining a full understanding of all the information you receive from each of these sources, along with all the individual customer information you collect from various other sources, becomes crucial. With OroCRM’s Channels, you can do both with minimum effort. In OroCRM, each Channel record represents one sources of customer-related data, as described in the Common Features guide. OroCRM Community Edition has two types of channels: Web (built for online stores) and Sales (built for business-to-business activities). For enterprise clients, additional types of channels can be added during system integration. There is no limit to the number of Channel records that may be defined for one OroCRM instance. Upon creation, you can choose what kind of customer-related information will be collected from each channel, as described below. Go to the System>Channels page. Click the Create Channel button in the top right corner. The Create Channel form will appear. Specify the channel details as described in the sections below. Define basic channel information in the General section. Current status of the channel. Be aware that when working with inactive channels, no new data is uploaded into the system. This option is useful if a channel is being configured for future or is out of date. Name The name used to refer to the channel in the system. It is recommended to keep the name meaningful. Channel type defines a set of default rules and settings used for the channel. Sales: dedicated to business customer relations. Described in more detail in the Sales Channel guide. Magento: designed for Magento-based stores. Described in more detail in the Magento Channel guide. 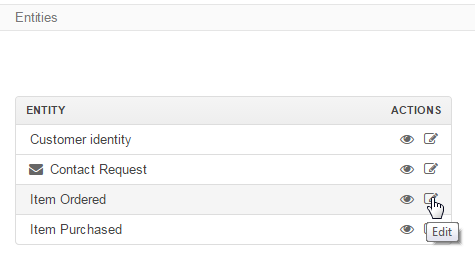 Once you have selected Magento as a channel type, a new mandatory Integration* field will appear. Please see the Magento Channel Integration guide for more information. Extending OroCRM with new channel types for specific needs is a proven practice and this can be done in the course of customization, subject to your specific needs and goals. The information collected from a channel is represented by the entities assigned to the channel and their related entities. Please, read the Data Management Basics guide to learn more about entities. In order to assign an entity to a channel and collect the data from the channel, go to the Entities section. Some other entities are by default added to channels of a specific type. For example, once you have selected the channel type, the Opportunity and Lead entities will be added to Sales channels, and the Cart and Order entities—to Magento channels. These entities will be added to the entity list by default, however, they are optional and may be removed. Custom Entities are created for specific customer needs and may contain any relevant data, including additional customer details, information about the sales, etc. All the custom entities are available in the drop-down menu of the Entities section for a channel. The ways to create and manage custom entities, are described in the Entities guide. To add an entity to the channel, choose the entity and click the Add button. To delete an entity, click the Delete icon. This will remove the entity from the channel’s list, but not from the system. Once you have finished adding the entities, click the button in the top right corner to save it. Once a channel has been deleted, all of the data related to it will be deleted as well. You cannot edit the channel type if data from the channel has been already been uploaded into the system. Deactivate or activate channels. No new data from the channel will be uploaded for an inactive channel. Get to the Edit form of the channel. Go to the “Entities” section of the channel view page. In the “Actions” column, click to see the entity details or to change the entity settings. Please refer to the Entities guide for more details. Note that you will receive an error message if you do not have the necessary permissions to edit entities.